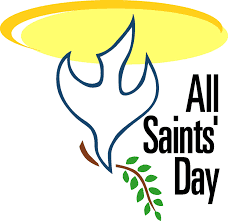 Today, November 1, is All Saints Day. It is a day celebrated in the Catholic church since the seventh century. It is one of those holy days which is celebrated here at UU A Way Of Life of Ministries where our mission is to santify the world by helping people become holy. There are many holy people who have gone before us and who are here with us now. People who have achieved holiness are people who have awakened and who have walked, or are walking, on the path of the spirit instead of the ego. These people radiate joy and peace and empathy for others. Who are the holy people in your life you have learned from and benefited from knowing? The holiest person I have known is Rev. Edward J. Lintz, the pastor at the Nativity of the Blessed Virgin Mary Roman Catholic Church in Brockport, NY in the 60s and 70s. People with holiness function with integrity. They are authentic, genuine, honest, fair, and nonjudgmental. These people give us love and hope and a sense of reassurance that there is goodness in the world. The third principle of our Unitarian Univeralist covenant is the acceptance of one another and encouragement to spiritual growth which is something we aspire to do every day at UU A Way of Life ministries where our UU covenant based on our seven principles is not just pious words but a way of life. It is in daily living this life that we intend to become holy.